I love beer. And as a self-proclaimed beer authority, I state that the best beer you can get in Ontario is a product of local microbreweries. That's why Bow & Arrow holds a very dear place in my heart. At any given time, they have up to 27 local beers on tap, usually including several cask-conditioned brews. On this occasion my friend and I kicked off the evening with Black Oak creations: a pint of Chocolate Cherry stout and a cask-condition version of their famous Pale Ale. Both were promptly delievered by our cheerful and articulate waiter. In general, despite a very busy night (it was a Friday, after all), we were served quickly and smoothly. As a Bow & Arrow regular, I can attest that every server I've ever met at that place was courteous, professional, and passionate about beer. The service was excellent on every occasion I showed up there - and the occasions have been numerous. Even patrons who order a bottle of Coors Light are served with a smile (it takes me almost superhuman restraint not to cringe every time I overhear such an order in a place that has such a delightfully varied selection of first-rate local brews). The excellence continues when it comes to food. 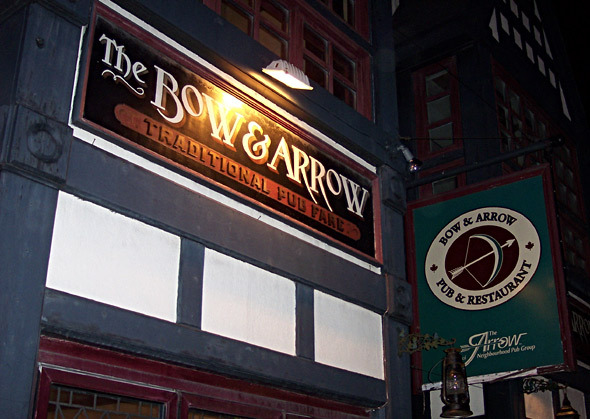 Bow & Arrow is not a gourmet dinner destination, but it offers a yummy array of way above average pub fair, including signature "Taste of Ontario" items, made entirely with local ingredients. As I learned over the years, it's very difficult to go wrong when choosing munchies at the Bow & Arrow. All the standard pub food items (and quite a few non-standard ones) are there, and are very well executed. The burgers ($8.25-12.74) are generously-sized, juicy and creatively topped (among the toppings are guacamole, tzatziki and curried chutney), and I really have a soft spot for their fantastic wings ($10.99) which come in BBQ, Honey Garlic and "legendary" (according to the menu) sea salt and pepper. This evening though I opted for a pizza entitled Little Italy Inspiration ($10.99), and my companion ordered Harvest Ale Lamb Stew ($11.49). My pizza was so delicious that any Italian resto, including ones that specialize in pizza, would have been proud to serve it. 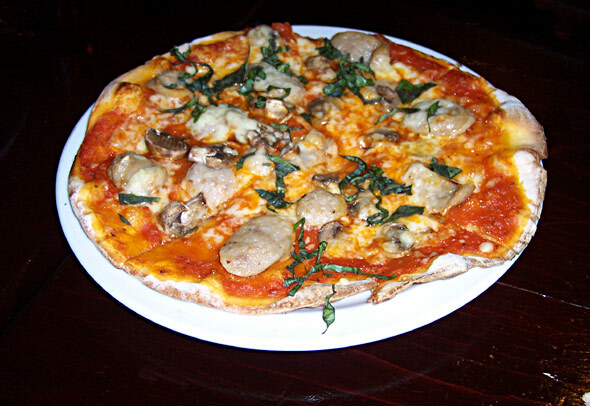 Topped with sausage slices, tomato sauce, fresh basil, mushrooms and mozzarella, it came with a crunchy thin crust and disappeared literally within seconds (I barely managed to snap a picture of it). In fact, we enjoyed this culinary creation so much that we ordered and gobbled down another one later in the evening, despite being quite stuffed already thanks to the Bow & Arrow's generous portions. 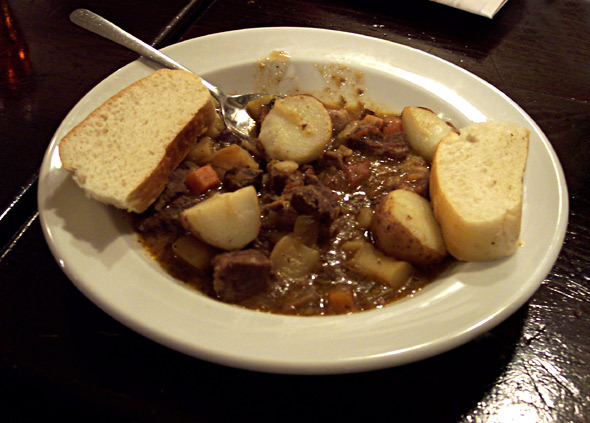 The lamb stew was a big hit as well. The lamb chunks were very tender, and the soft fresh bread the dish comes with is just the thing for mopping up your plate to catch that last drop of that delicious herbed sauce.